Posted on June 6, 2014	by Rev. Rosemary Hyde, Ph.D.
We had heard that the Rodin Museum was a favorite Parisian hangout for many folks, and when a Meet Up was planned there for dinner on Wednesday, we figured it would be a good reason also to visit the museum. It was another bus adventure — we found the 82 at Luxembourg where it apparently originates, and were astonished when it went around the Luxembourg Garden and took a short cut to get to Montparnasse within a few minutes. Since we were planning to go to Chartres the next day, it was encouraging to realize that the train station from which we were leaving was that close to our familiar haunts. 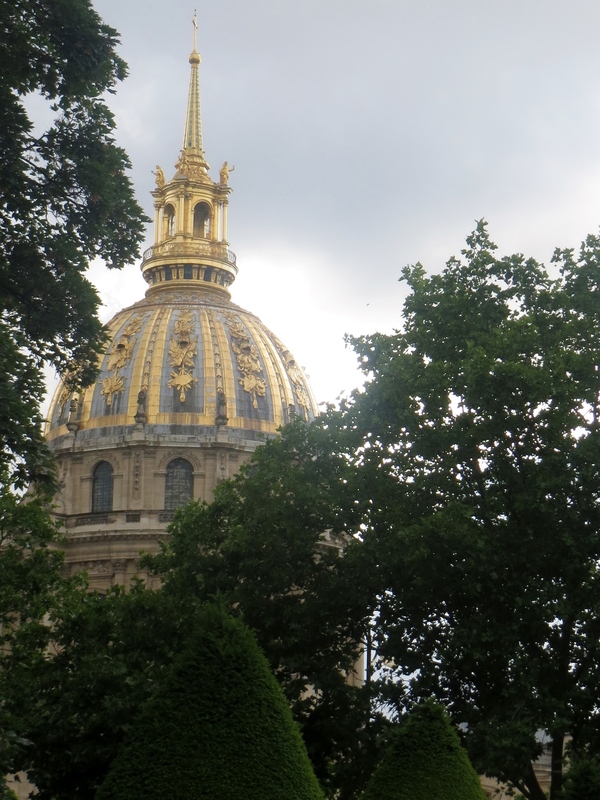 Then the bus took us into what was for us new territory, and let us out in front of the Invalides, which hadn’t previously been on our radar. It was a huge church building with an enormous gilded dome inlaid with beautiful mosaics. Surrounding the supersized domed church building was an enormous hospital complex set in an even more impressive and perfectly tailored formal garden. Apparently it was built as a veteran’s hospital in the time of Louis XIV, the “Sun King” of the 1600s. It is so grand that it served as inspiration for many later domed buildings, including the United States Capitol Building in Washington DC. Nowadays the complex is mostly a military museum, as well as a pantheon of French military heroes, including Napoleon himself. The garden is a wonderful formal French layout of perfectly sculpted evergreens surrounded by swirling paths, with the Eiffel Tower looming over the whole. It was all so beautiful and majestic. We were surprised to get off the bus and find ourselves in such a breathtakingly beautiful place. Paris has so many magnificent monuments and parks. The Rodin Museum was somewhere in the neighborhood, and after walking around parts of the Invalides, we consulted our maps and set off in search of it. 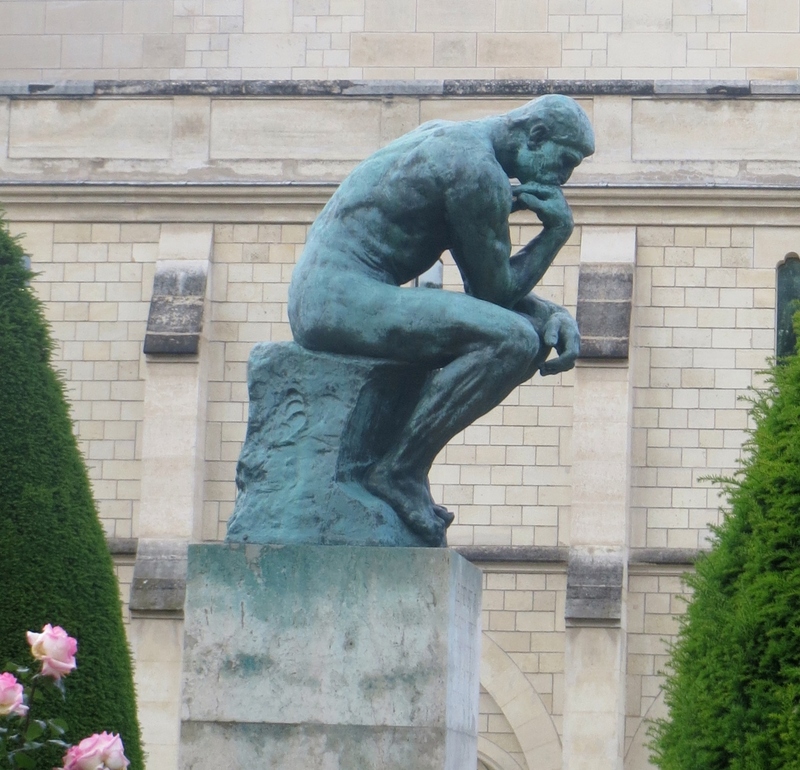 The famed sculptor Rodin mostly lived and worked in a suburban village called Meudon, where he had a house. But late in his life, he had decided to leave his house, and rent a house in Paris, to work there for a while. His personal assistant, who came with him, was the famous poet Rainier Maria Rilke. 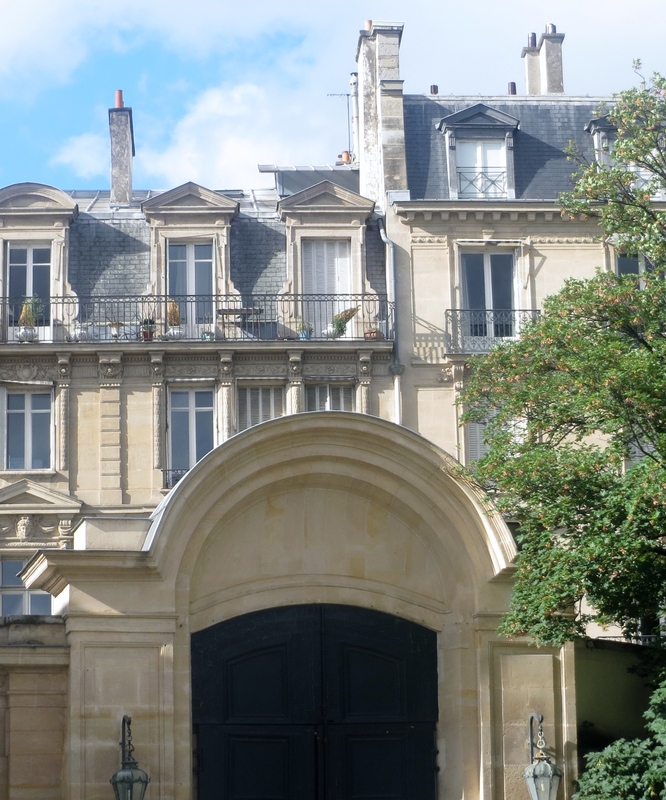 This Paris “house” turned out to be an elegant “hotel particulier” — an enormous mansion surrounded by a parklike property. The house itself was closed for renovations and repairs. However, we discovered that the museum was showing in another building an exhibit comparing the work and the esthetics of Rodin with twentieth century American photographer Robert Mapplethorpe. The basic premise of the exhibit was that both Rodin and Mapplethorpe, in their respective eras and artistic media, were extraordinary explorers and artists of the human form. This theme made a lot of visual sense, and the show, indeed, was both beautiful and interesting. 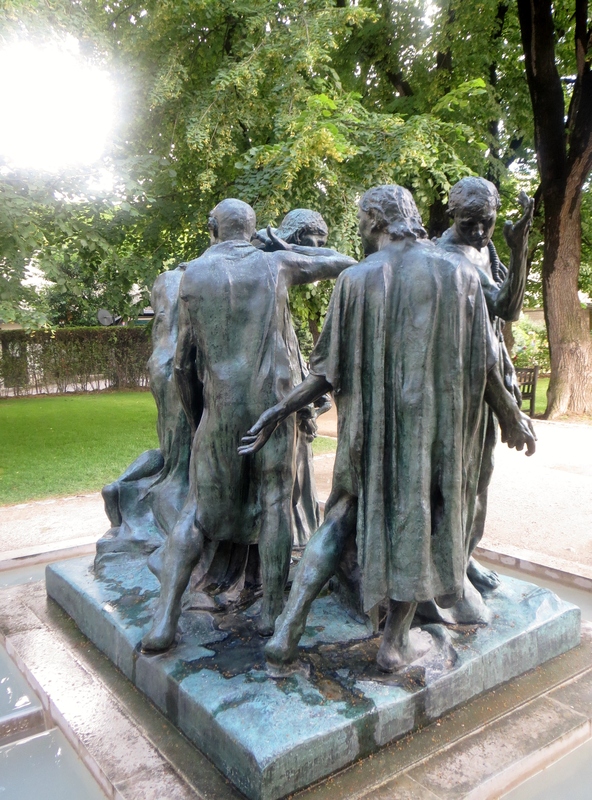 Then, In walking through the museum garden, I was surprised to see that several of Rodin’s major works were here. It was exciting to be able to walk around the Burgers of Calais (the bronze sculpture depicting 6 leaders of the city of Calais on the English Channel who had volunteered to be executed by the English King Edward in 1834, in exchange for Edward’s sparing the city from destruction by his army.). Apparently the original cast is shown in front of the Calais city hall, in Normandy, the space for which it was commissioned in the 1800s. But another cast that had been made was donated to the Rodin Museum so that we could enjoy it there. 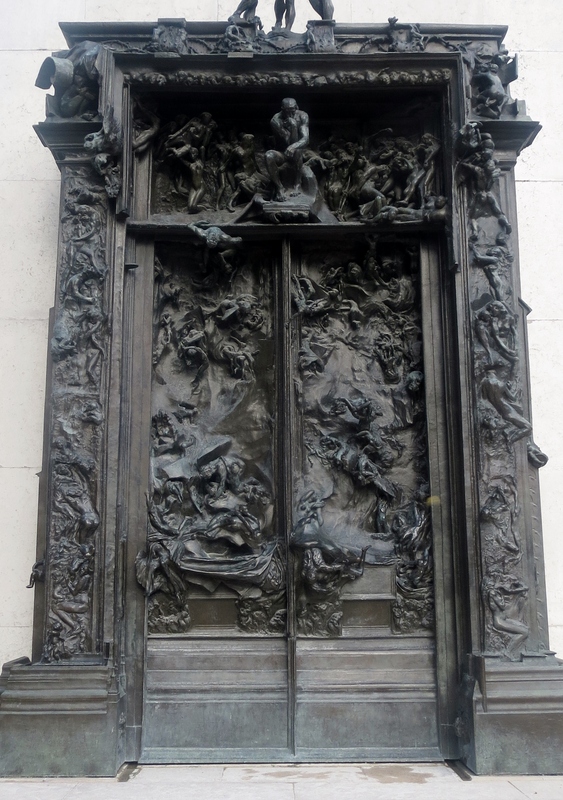 There is also a Rodin Museum in Philadelphia that has yet another cast of the original sculpture. Rodin did a beautiful job catching and portraying the sense of doom under which the six chosen leaders approached their execution. It is a beautiful, complex three dimensional composition, fascinating from every angle. It is also monumental in scale — larger than life. It was hard to imagine any foundry being able to cast such a heroic group of human figures attached to a base — a truly larger-than-life job. The get-together at the cafeteria of the Rodin Museum was very enjoyable. We met a dozen or so gay people of different nationalities who are living in Paris. It was interesting to talk with them and learn a bit more about living in Paris as an expatriate, and to hear their experiences in Paris and share ours. One of the people with whom we had an interesting conversation is an elementary school teacher teaching in an international private school in Paris — one where becoming a citizen of the world is a major curriculum objective. He’s from Ireland, but has taught in several places around the world — including Georgia and North Carolina — enjoying very much his life of serious travel and exploration of the world. It turned out that he had taught for several years in the public middle school in Atlanta that Nancy had attended many years earlier while growing up. It was a notable example of the “small world” phenomenon! 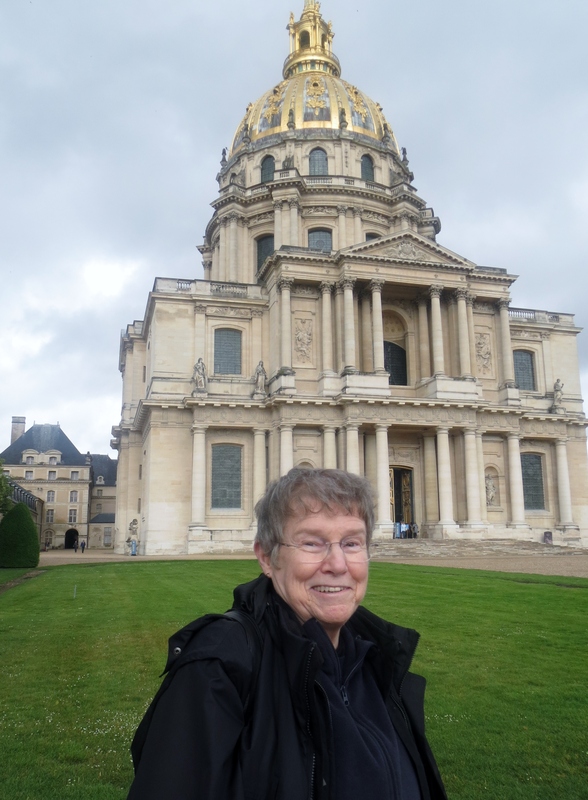 When we’d arrived at the Invalides, we hadn’t been able to see the bus stop for the return trip, and several of our new friends walked with us to the bus stop, to make sure we got back safely to our part of Paris. One of them even got on the bus with us to make sure we transferred successfully at the Gare de Montparnasse, since the bus line we’d come on had stopped running (Some Paris bus lines do that at 8 or 8:30, which is very early in Paris) — so we had to take a different bus and transfer to our home line. As we were riding on the bus together, he asked us where the apartment is that we had rented, and we told him the street. He thought for a minute and said — Bob and Rick’s apartment? Well, yes, in fact it is. Turns out he’s been to the apartment, as a friend of Bob and Rick. The world is ever smaller than anyone can imagine! How does this sort of thing happen?